One of the great gardens to receive an award (River Crossing). Photo credit: Lesley Van Winkle. From a City of Mill Creek Press Release. 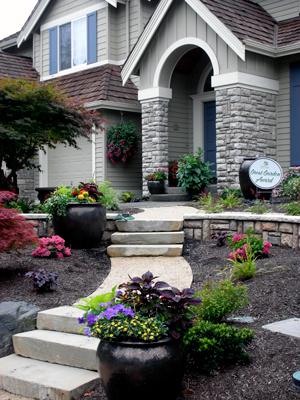 The City of Mill Creek’s Art and Beautification Board announced the winners of the 2013 Great Garden Awards. Each year members of the City of Mill Creek Art and Beautification Board tour the City and make note of those residents who have put exceptional time and effort into the beautification of their property. The Great Garden Award program gives awards across the City to deserving gardeners. Board members toured the City and took pictures of noteworthy properties and voted to determine this year’s winners of the Great Garden Award. Each winner receives a keepsake and a yard sign placed in their yard through the end of August. Winners will also be recognized by the City Council at the September 10, 2012 Regular Council Meeting.